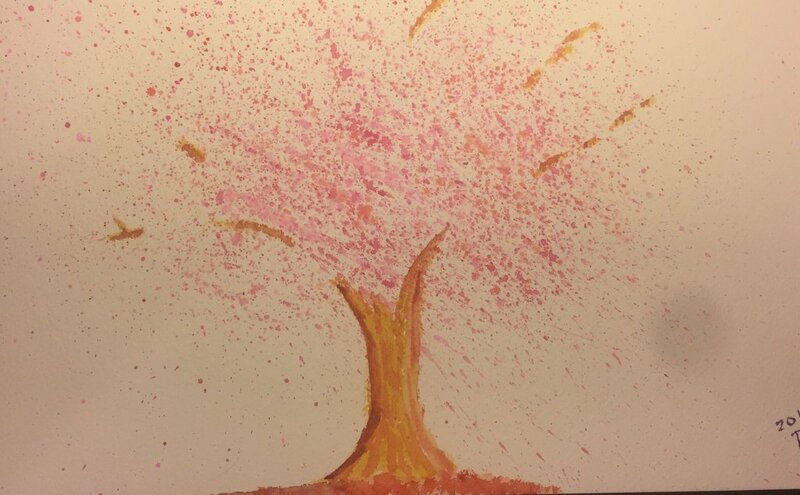 Last night, after painting my colour chart, I was a little bored so wanted to try a paint-spattering method to create a tree. 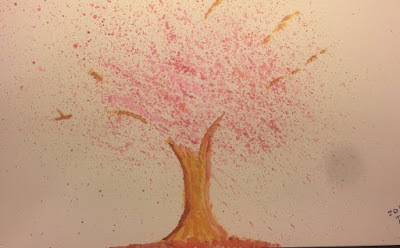 I've seen loads of people do this on YouTube and so on and thought I'd give it a try - all you do is make a fairly strong mix of paint and water and spatter it onto the page then, once dry, paint in the trunk and boughs. Close to my apartment are rows of ornamental cherry trees (Prunus serrulata Lindl. ), so I did it in that style, using Winsor and Newton Professional Watercolours in 448 Opera Rose, 502 Permanent Rose, 94 Cadmium Red, 587 Rose Madder Genuine and Winsor and Newton Designers Gouache in 748 Zinc White - each one alone and in mixtures with the others. I then painted in the boughs and trunk in a range of browns - but they're not finished as I need to re-paint them in a cooler brown really. It was a lot of fun, but very messy work! The leaves are ok - not perfect - and the trunk (etc) are just placeholders that I need to paint over in a cold brown. I'm going to try doing the same with autumn colours at some point.